Living in FL I am used to the passing rain showers we frequently get in the summer time, but this year has been a little much. This week we have had rain every evening. It seems to time itself perfectly for when I get home from work. So not much riding for me this week. 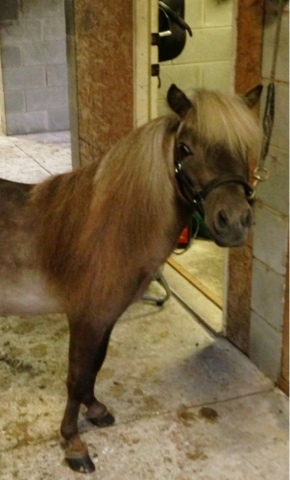 This week I finally gelded Cotton my mini pony. He turned 4 years old this week so it was a little past due! He got his wolf teeth out and will also be a solid citizen as a gelding. Not that he was ever anything else but there is no reason to have another stallion in this world. I did get to work Ketel on the lunge line one evening. I decided to throw him for a loop and put some little barrels out. I do this sort of thing in my jump pasture too. Whatever stuff I can find that might spook my horses I put it out. It helps desensitize them especially in the sport of show jumping where there is no schooling in the ring prior to showing. Currently I have some huge tires out there that I occasionally move around. Anyway, back to Ketel. 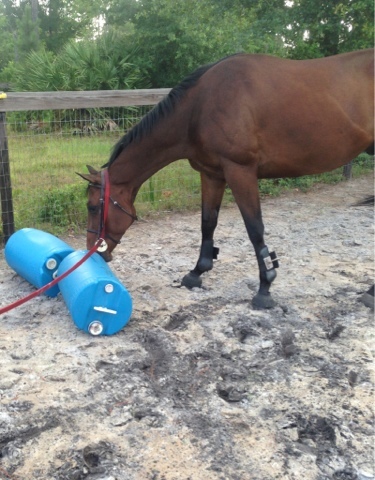 As soon as he saw the barrels he danced around and snorted. But what I love about him is he is so curious. Instead of running away he ran to them to investigate. Then the rains came. It litterally rained everyday until Saturday, preventing me from riding. It has been so miserable here between the rain and heat. Now Ketel isn't sweating. I think it has to do with this weather. I am going to keep an eye on him and if he doesn't get better I will have to call the vet and see what she thinks. Tomorrow is supposed to be 94 with high humidity. I hate that for the horses. I decided I am going to do bran mash in the morning for breakfast. Two years ago on our first hot as hell day of the summer Poppy stopped drinking water and got colicy. She was fine but I want to be proactive. Everyone will be inside under their fans but it still gets unbearable. I am home for the next couple of weeks then off to show in NC. I am seeing everyone posting about showing in Atlanta this weekend and I am so jealous. 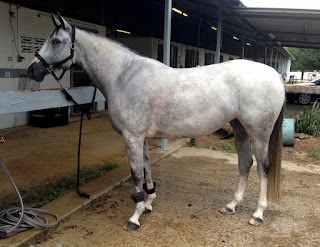 I wish my trainer was going but then again showing once a month is about all I have the energy for. I don't know how I used to do it every weekend. Oh yea, I was muuuch younger and only had one horse!! 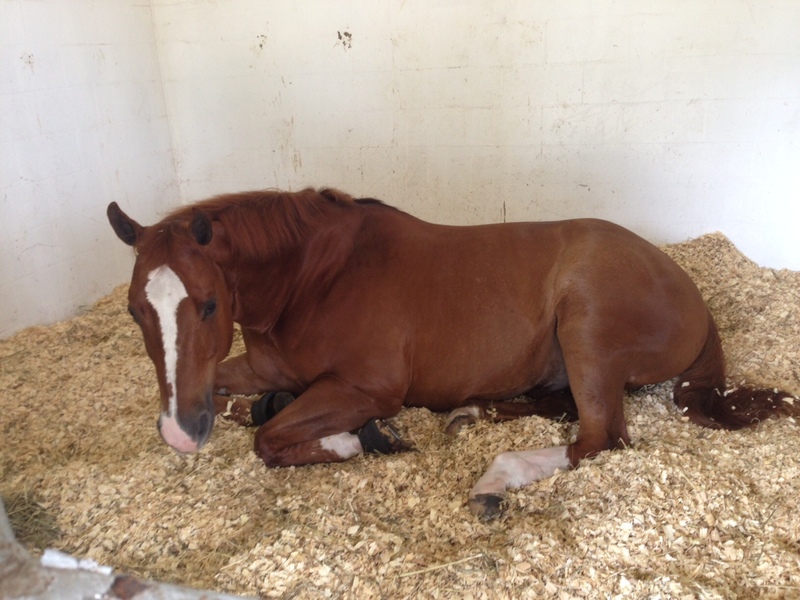 Tank resting up before his class.